When I am having a bad day, you can almost guarantee it is because I haven’t exercised in some shape or form. I’m incredibly unfit and I don’t enjoy exercising, but I do know that when I do it, I feel so much better for it. I’m a big fan of the incidental exercise, much to the chagrin of Mr 8. He got the lazy gene from his Mama. This year we have been walking to and from school everyday. When we started, Mr 8 complained so much that one would think I was making him complete a marathon each day, not the 1.5km we walked to school. It’s August now and we’ve only just reached the point where he has accepted that we are walking this term. I knew that I wouldn’t be the only one in this position so I decided to share my tips for a way to get to whinge free exercise! Make it part of your routine. When we first started there was lots and lots of complaining. As hard as it was, I tuned it out. I told him that we were doing this now, and that was the end of it. Any complaints were met with a repeat of that phrase. Distraction: Just like when tantrums plague the world of life with a toddler, distraction works well with a school aged kid who doesn’t want to do something. I used a mix of questions about his day and pointing out things along our route. We would even go through the alphabet and try to find things that started with each letter. The end of the alphabet got tricky! Be honest about the need for a healthy lifestyle. I talked with Mr 8 about how being active makes us feel good and that being fit helps us to play with our friends at school. Wearable technology: Last month I bought Mr 8 a Vivofit Junior after he showed interest in my fitbit. It’s been great for getting him interested in seeing how active he is during the day and wanting to beat his Mum’s step count for the day! It also has the added feature of a chore list with rewards. We’ve used this to help get into a routine before school and for bedtime. He knows what he needs to do and that he gets a coin for completing it. Good old fashioned bribery. 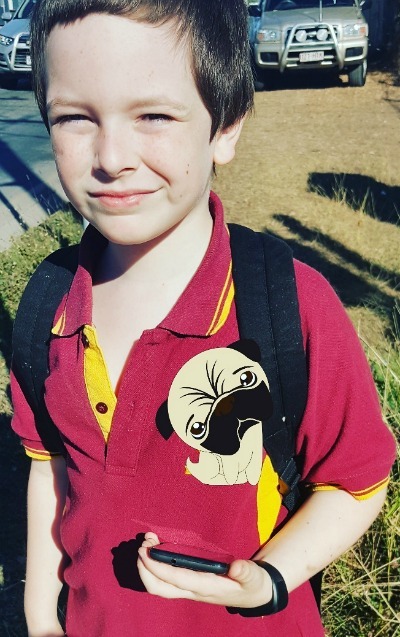 When we first started walking, I told Mr 8 that if he walked for a whole week without complaining then he’d get a treat from the shop on the way home from school. Acknowledge their feelings. We all do things that we don’t want to do. We all have to get on with it. However it also helps when someone acknowledges that it’s a crappy thing to have to do. Plan a walk/ride to somewhere they want to go. 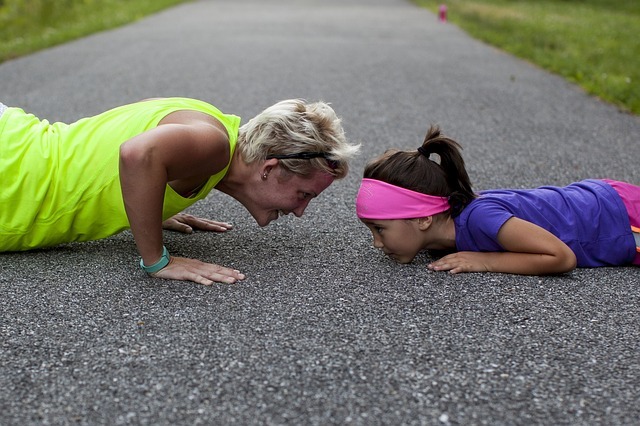 Exercise isn’t just school runs around here. We also walk to the park, which Mr 8 loves. He rides his scooter while I walk and then he gets to play at the park too. It’s a win-win. Find a fun walking app. Last year I found a walking app that involved a zombie apocalypse. Mr 8 loved it. However I wasn’t so keen on him carrying my phone while we walked. He had an old phone of mine, but the battery doesn’t last very long. So when I was asked if I wanted to review a new smartphone, I knew the perfect use for it. In steps the new Alcatel Pixi Vibe. The Alcatel Pixi Vibe is small enough to fit in his small hands and still powerful enough to host the games that he loves. Even though the phone itself only has 5gb of storage, it can be expanded with the use of a SD Card. The phone runs on the Android system and is very similar to the Samsung range of phones. This made it super easy for me to use and the features simple to find. Mr 8 loves the phone and has been giving it a real work out. The battery lasts a surprisingly long time for an inexpensive handset. Even with playing heavy graphic games the battery lasts most of the day. 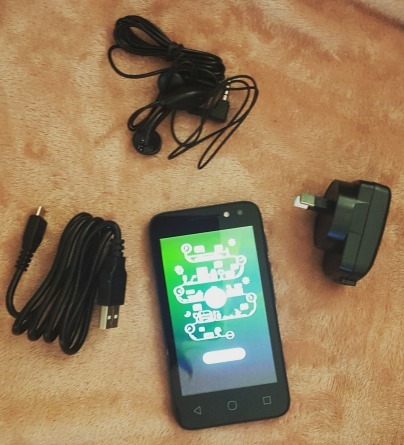 The Alcatel Pixi Vibe retails for a small $69 so is perfect for a first kids phone. Don’t take my word for it though, enter my giveaway and have the chance to find out for yourself. That’s right, I have one handset to giveaway to one lucky winner. All you have to do is answer the question: How do you make exercise fun? Entries are open to Australian residents only. One entry per household. Duplicate entries will be deleted. This is a game of skill. All judgements are final. Entries close Monday 4th September 2017. In order for entries to be valid, you must answer the question, ‘How do you make exercise fun’. 1.) They do sport they love which atm is AFL on a Sunday and they have gotten to train with Carlton, play at half time in a real AFL game plus be part of the AusKick advertising campaign for 2018. All of that was a lot of fun. 2.) Walk to and from school but play games doing it e.g. eye spy, some of my daughters speech therapy ‘games’ (2 birds with 1 stone there, haha), spot animals and we discuss all sorts of things. 3.) Wheelies or similar. Sometimes instead of walking my kids wear wheelies or use their scooters. 4.) Do it with friends. We go to the park, kick the football around, walk around with friends, play Pokemon etc. 5.) Photography walks. My kids like taking photos, making movies and things with their iPads. Sometimes we have walked 20kms in 1 day doing this. We recently discovered geocaching. I find that we will all happily walk for hours as we GPS search for the ‘treasure’. It’s a fabulous outdoors family activity. I find that modelling an active lifestyle is definitely the best way to motivate my kids. I actually had a school mum tell me that I was selfish for still playing sport in my 30s, when I should be focusing on my kids. Yet my children see me enjoying competitive sport, they see me participating in obstacle races, and triathlons, and they want to do it too. I love that my 8 year old begs to come running with me, and asks me to take her to the track for sprint training. I coach my kids, train with them, take them to watch me train and play. It normalises physical activity as a daily habit for them.